STING (STimulator of INterferon Genes) has become a focal point in immunology research as well as a target in drug discovery. 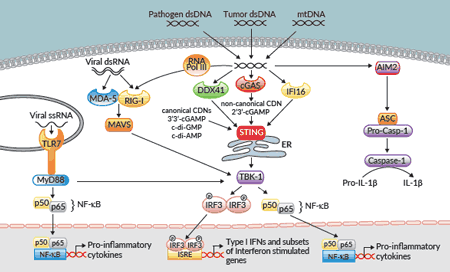 As a signaling hub in innate immunity, STING is a pattern recognition receptor (PRR) of paramount importance in orchestrating the body’s response to pathogenic, tumor, or self DNA in the cytoplasm. 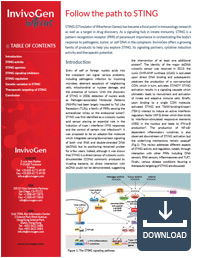 InvivoGen offers a growing family of products to help you explore STING, its signaling partners, cytokine induction activity and therapeutic potential. Entry of self or foreign nucleic acids into the cytoplasm can signal various problems, including pathogenic infection by incoming microbes, aberrant apoptosis of neighboring cells, mitochondrial or nuclear damage, and the presence of tumors. Until the discovery of STING in 2008, detection of nucleic acids as Pathogen-associated Molecular Patterns (PAMPs) had been largely imputed to Toll Like Receptors (TLRs), a family of PRRs sensing the extracellular milieu or the endosomal lumen. STING was first identified as a cytosolic nucleic acid sensor playing an essential role in the induction of type I interferon (IFN) responses and the control of certain viral infections. It was proposed to be an adaptor-like molecule which integrates sensing/downstream signaling of both viral RNA and double-stranded DNA (dsDNA), but its positioning remained unclear for a few years. Indeed, although it was shown that STING is a direct sensor of cytosolic cyclic-dinucleotides (CDNs) commonly produced by invading bacteria, its direct interaction with dsDNA could not be demonstrated, suggesting the intervention of at least one additional protein. The identity of the major dsDNA cytosolic sensor was resolved in 2013: the cyclic GMP-AMP synthase (cGAS) is activated upon direct DNA binding and subsequently catalyzes the production of a non-canonical CDN, which in turn, activates STING. STING activation results in a signaling cascade which ultimately leads to recruitment and activation of innate and adaptive immune cells. Briefly, upon binding to a single CDN molecule, activated STING and TANK-binding-kinase-I (TBK1) interact to induce an active interferon regulatory factor (IRF3) dimer which then binds to interferon-stimulated responsive elements (ISRE) in the nucleus and leads to IFN-α/β production. The production of NF-κB-dependent inflammatory cytokines is also observed downstream of STING activation butthe underlying mechanisms remain opaque. This review addresses different aspects of STING activity and regulation, notably through interaction with other PRRs including DNA sensors, RNA sensors, inflammasomes and TLR7. Finally, various disease conditions favoring a therapeutic targeting of STING are discussed.